Miss Shirley's blend of down-home soul and uptown savvy makes this charmer of a café a winning choice for breakfast or lunch. 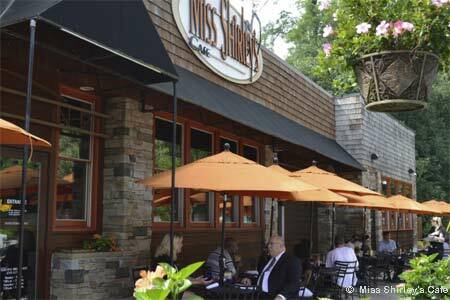 : Miss Shirley's is a mixture of down-home soul and uptown savvy. If she were a woman, every man in town would want to marry her. She's a restaurant, but she's still one of the most popular girls around. The café sports a sleek, contemporary American Beauty-hued dining room with banquettes and pendant lights. The menu features Southern-style breakfasts and brunches with nouvelle accents --- fried green tomatoes with lemon-herb aïoli, for example --- and crush-worthy sandwiches. Try the Bay-O po’ boy with cornmeal-encrusted soft shell crab and Tabasco bacon-onion jam on ciabatta, or the Eastern Shore slider trio of pulled barbecue chicken, crab and shrimp salad, and mini crab cake. Beer, wine and brunchy cocktails are served. A food truck has been introduced, too. Also located at 750 E. Pratt St. (Inner Harbor), 410-528-5373; and 1 Park Place, Annapolis, 410-268-5171.